UPDATE AUGUST: we’re holding one more audition on september 7! After two great auditions before the summer, we still have room, especially for men! Are you at home on the stage, a talented singer with experience in vocal groups/choirs and interested in improvisation? Are you ambitious to grow and develop your musical and impro skills, and willing to take initiative in a dynamic group that works with rotating leadership? DOC, winner of the ‘most innovative performance’ prize at Aarhus Vocal Festival 2017, has ambitious plans for 2018. Not only are we working on giving concerts and workshops all over Europe, we’re also developing our first full-length show in our own unique blend of improvised and composed vocal music. And we have opportunity for you! DOC, currently with 12, wants to expand to 16. Contact us for an audition. Rehearsals are weekly on Thursday evening in Utrecht. Mail auditions@dutchorganicchoir.nl us or see our website for more details. A professional attitude. DOC rehearses weekly, and preparation is required. Willingness to share in the organisational aspects of DOC. DOC works according to the organic choir principles of rotating leadership, which demands an active attitude. Have experience with improvising… however this is not necessary. We are training ourselves in different forms of impro, and we are life long learners. You’ll surely get experienced soon enough, as long as you’re not afraid (or willing to face your fears) of improvisation and are willing to make mistakes. No guts, no glory! can do beatbox or vocal percussion, or have other special vocal skills. An inspirational environment where you can challenge yourself. DOC is a diverse group and we share our different knowledge and experiences! This is one of the aspects of the rotating leadership. Rehearsals often take the form of a series of mini-workshops in singing, rhythm and impro. We’re looking forward to your unique skills! DOC has ambitious plans for 2018. We are currently working on organising concerts and workshops all over Europe, we’re also developing our first full-length show in our own unique blend of improvised and composed vocal music. A nice aspect of the rotating leadership: since we have no conductor or musical leader that has to be paid, our rehearsal costs are kept to a minimum. DOC has weekly rehearsals on Thursday evenings in Utrecht (19:45 – 22:30). Members of DOC come from all over the Netherlands. For those who come by train, a quick ride back to the station is always possible. 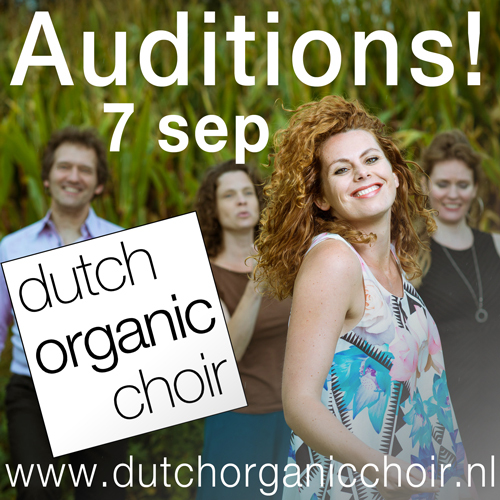 Mail auditions@dutchorganicchoir.nl to make an appointment to come to an audition, or if you want more info.